On this date in 1807, the British navy hanged Jenkin Ratford from the yardarm of the HMS Halifax off the coast of Maryland — an incident destined to become a rallying cry for the United States in the ill-fated War of 1812. Britons never will be slaves. The Britons who got to do the grunt work of wave-ruling might disagree. Seaman in the Royal Navy, and that huge navy needed many seamen, was a harrowingly brutal position often filled by press gangs empowered to grab anyone not able to produce immediate evidence of exemption and have them by next morning swabbing the nearest frigate on a ration of wormy hardtack. Desertion was correspondingly popular and more radical resorts not unheard-of; the mutiny on the Bounty had occurred in 1789; two other mutinies much more alarmingly proximate to Old Blighty took place in 1797. Congress got a start on that project with a 1794 naval act creating the original six frigates of the U.S. Navy. The USS Constitution is the most famous of these; one of her five sisters, the Chesapeake, will figure in the action of this date’s post. 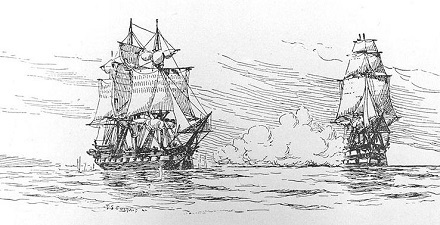 In 1806, two French ships, the Cybelle and the Patriot, struggled into Maryland’s Chesapeake Bay for repairs after being crippled by a storm at sea — stalked by British ships that blockaded the mouth of the Chesapeake to trap them there. The proximity of American soil proved an irresistible inducement for at least four sailors on the British ships to desert. Three of them — William Ware, Daniel Martin and John Strachan — were American victims of British impressment. The fourth, our man Jenkins Ratford, was a Limey. They then enlisted in the American Navy. Great Britain’s demands for their return met with steady refusal on the American side. Knowing that the deserters had been posted to the Chesapeake, which was then outfitting for deployment to the Mediterranean, British ships in the vicinity of the North American coast were ordered to stop the Chesapeake on sight to recover the absconders. This the HMS Leopard did do on June 22, 1807, and with a singular lack of subtlety: the Leopard battered the Chesapeake with broadsides. Shocked and unprepared, the Americans couldn’t even fire back before striking colors and yielding to a humiliating British search that hauled off Ware, Martin, Strachan and Ratford. The HMS Leopard (easily recognizable since it’s the only ship firing!) vs. the USS Chesapeake. Ratford, the only actual British citizen among the shanghaied sailormen, was the only one executed. The Americans “merely” got prison sentences. At the political level, President Jefferson had a thorny problem. The British could in no way be induced to meet the American demand to end impressment, for simultaneous with the scandal Napoleon was finalizing victories that would knock Britain’s continental allies out of an altogether more urgent war. No derogation of security interests could be entertained, and so for America, no diplomatic satisfaction could be forthcoming. Instead of war, Jefferson responded by convincing Congress to enact an embargo on trade with Europe. It proved to be a counterproductive policy that damaged the U.S. far more than the European export markets it had intended to punish. The U.S. and U.K. would come to blows soon enough, and if the War of 1812 was hardly fought because of the Chesapeake-Leopard affair, that incident was certainly among the contributing grievances. Injuries more directly attributable were not hard to come by, however. When James Barron, the suspended former commander of the Chesapeake, sought reinstatement to the navy, early American naval hero Stephen Decatur opposed him with vehemence sufficient to induce Barron to challenge Decatur to a duel. 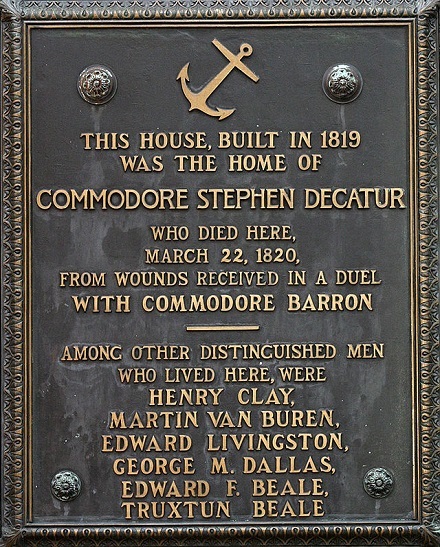 Decatur was slain in the fight, shockingly pinching out one of America’s leading military figures at the age of 41. (cc) image by David King. The Chesapeake herself fared little better. The ship was captured by the British in the ill-fated War of 1812, and recommissioned into the hated Royal Navy. Sold off for scrap in 1819, its timbers were repurposed for a long-lived (and now historic) Hampshire watermill — the Chesapeake Mill. * See what I did there. ** Halifax the city is where they were tried; the HMS Halifax, which was Ratford’s ship prior to desertion, is where Ratford was executed. It’s Halifaxes all the way down. † Thanks to this incident, the very name “USS Chesapeake” became so blackened in American naval history that it has barely been touched for any vessel since. ‡ Father of the DuPont who founded the DuPont chemical company and made that family perpetual American plutocrats down to the present day.